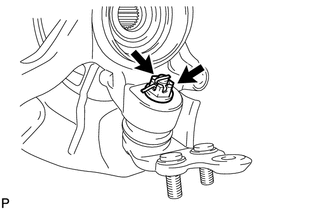 (a) Install the front lower ball joint to the steering knuckle with the nut. Prevent oil from adhering to the screw and tapered parts. 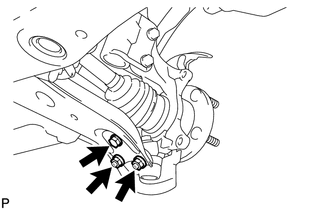 If the holes for the cotter pin are not aligned, tighten the nut further up to 60°. 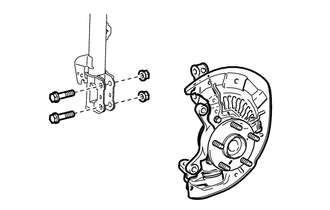 (a) Install the front axle assembly to the front shock absorber with the 2 bolts and 2 nuts. 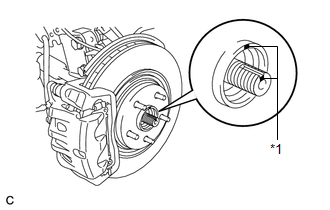 (a) Install the front disc brake caliper assembly to the steering knuckle with the 2 bolts. 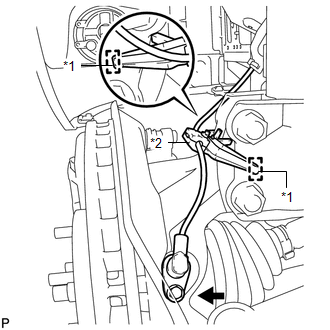 (a) Install the clamp and front speed sensor with the bolt. Prevent foreign matter from attaching to the sensor tip. 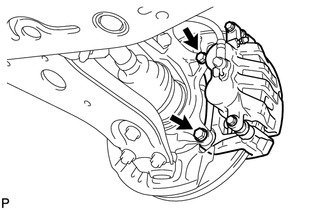 After installing the sensor to the knuckle, make sure that there is no clearance between the sensor stay and knuckle. Also make sure that no foreign matter is attached between the parts. Check ABS speed sensor signal (See page ).